In September 1995, a production of Jane Austen’s Pride and Prejudice aired on BBC One. Adapted by Andrew Davies, produced by Sue Birtwistle and directed by Simon Langton, this six-part serial made instant stars of several of the actors and gripped the nation. Twenty years on, Chawton House Library invites you to a day of talks to celebrate and commemorate this landmark in television history. 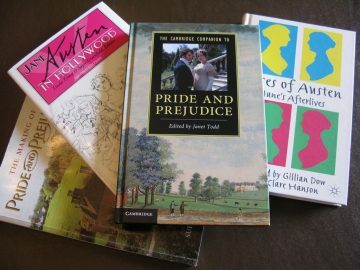 Speakers who have published widely on Jane Austen in adaptation will reflect on the place of Pride and Prejudice in popular culture before and after 1995. Simon Langton, Director, will reminisce on his own role, and the day will close with a roundtable involving some of the original cast and crew. Speakers include: Simon Langton, Director of the 1995 production, whose credits include many period-drama productions for television; Devoney Looser (Arizona State University, author of Jane Austen and Discourses of Feminism); Nora Nachumi (Yeshiva University, author of Acting Like a Lady: British Women Novelists and the Late Eighteenth-Century Stage); Sayre Greenfield (University of Pittsburg, Greensburg) and Linda Troost (Washington and Jefferson College, Pennsylvania, editors of Jane Austen in Hollywood), and Juliette Wells (Goucher College, author of Everybody’s Jane: Austen in the Popular Imagination).